I've decided to try a writing experiment! I know this has been done by others en masse but on my own I just want to try and blog every day through November. It's a grateful month-and I'm grateful to my blog for the joy it brings me so I am going to give it more attention. I blogged yesterday about Abigail Iris, the one and only and today I am just putting my challenge in writing. 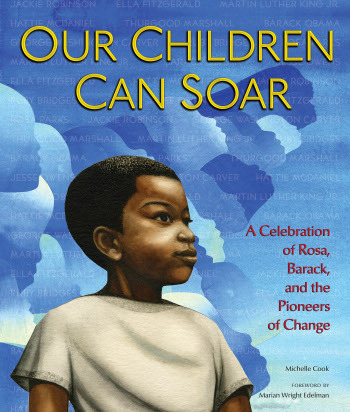 I did read this fantastic book (Our children can soar; a celebration of Rosa, Barack, and the Pioneers of Change) over the weekend and plan to share it with 5th grade this week. This book takes us on a journey from the beginning illustration of slavery and the Civil War, George Washington Carver and ends with Barack Obama's historic campaign for the presidency. On one hand this book captures the hope and spirit of not only that campaign but our history of change (slow, yes) but through its simple statements it shows how our previous knowledge helps us understand the world around us. If one were to read the book and not know who George, Jessie, Hattie or Ella were the story would not make as great impression. It is all this background knowledge we need to get to our students before they can understand other books like A Friendship for today, Chains, The Watson's go to Birmingham, or Elijah of Buxton. This book would make a great introduction for many lessons on U.S. History but will make a perfect example of understanding schema for fifth grade students. I love it when a great book like this comes along, which makes it easy to explain a monumental point to students. Of course, I can't really finish talking about this amazing book without mentioning the beautiful illustrations created by 13 different illustrators! They are Caldecott- worthy; simple yet meaningful. Marian Wright Edelman writes a glowing forward to show the giant leaps this book demonstrates! She says "African American history is the collective story of many, many people who never gave up and never turned around, but instead always quietly took that next step forward in faith so their children would be able to go even farther and have better lives."